Subject: Plate : 'Triest'. 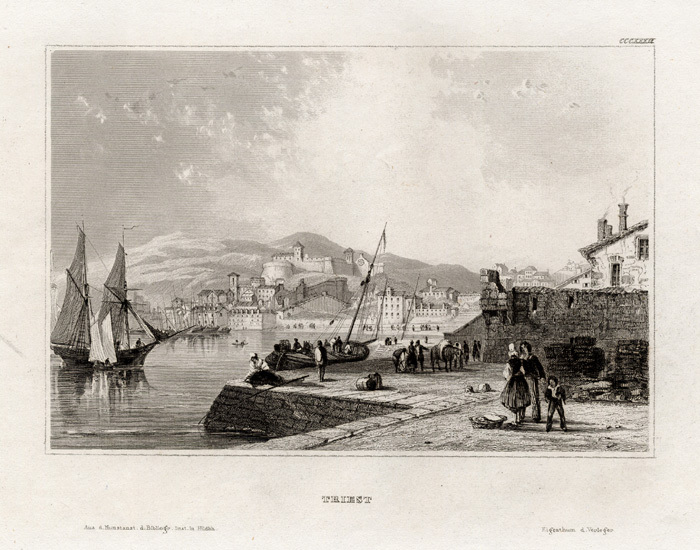 This plate shows a view of the city of Trieste, Italy. Medium: Engraving on a vellin type paper. Rear blank. Print originates from book / atlas. 100% authentic. Size (in cm): The overall size is ca. 26 x 18.5 cm. The image size is ca. 14.5 x 11 cm. Size (in inch): The overall size is ca. 10.2 x 7.3 inch. The image size is ca. 5.7 x 4.3 inch. Description: This original old antique print is taken from 'Meyer's Universum', published in Germany ca. 1850. Artists and Engravers: Joseph Meyer (1796 - 1856) was a German industrialist and publisher, most noted for his encyclopedia, Meyers Konversations-Lexikon. He also published the world in pictures on steel engravings 'Meyers Universum', 1833-1861, 17 volumes in 12 languages with 80,000 subscribers all over Europe.